The Model IND-100 Pressure Transmitter has been designed for use in a variety of industrial applications such as plant process and utility pressure measurements, compressor control, and hydraulic and pneumatic manufacturing systems. EMI/RFI resistance is critical and is provided on the AMETEK IND-100 Transmitter as protection against noise-generating variable speed motors and radio equipment that is common on the factory floor. AMETEK utilizes the most stable sensor available for IND-100 transmitters, sputtered METAL THIN FILM technology. The wetted surfaces are 316L, and Hastelloy. 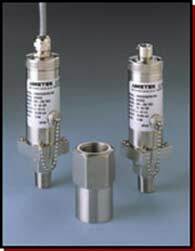 IND-100 transmitters with pigtail connectors are also NEMA 4X rated to meet the needs of outdoor installations. 100 PSIG, 250 PSIG, 1000 PSIG, 2000 PSIG, 3000 PSIG. Alternate ranges, including bar also available. Please inquire. AMETEK U.S. Gauge Division, 900 Clymer Ave., Sellersville, PA 18960. Tel: 215-257-6531; Fax: 215-257-3058.